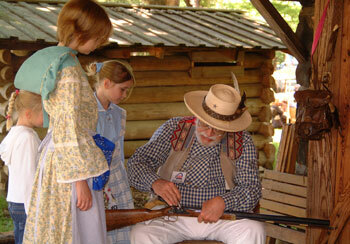 More than 20,000 visitors are expected to learn about life in the 1800s during the 22nd annual Gen. Sam Houston Folk Festival May 1-3 at the Sam Houston Memorial Museum grounds. The historical event will include live history re-enactors performing vignettes and theatrical interpretations, costumed historical characters, folk life demonstrations, arts and crafts, dulcimer workshops, live acoustic music, a living history theatre and ethnic foods. In addition, attendees will have the opportunity to see programs by New Army of the Republic of Texas, Cane Island Volunteers, Brazoria Militia, Cowboy Camp, Citizen Soldier Camp, and Indian Camp; and learn about Texas history by historical storytellers representing significant leaders from Texas history. Other activities include touring buildings related to Houston’s life, juried activities, ethnic foods and refreshments, and musical entertainment. The Gen. Sam Houston Folk Festival will be open from 9 a.m. to 6 p.m. on Friday and Saturday and from noon to 5 p.m. on Sunday. Admission is $7 for adults, $3 for children ages 5-12 and free for children under 5 years old. In addition, group rates, for a minimum of 15 people, are available for $3 per person. For more information, call the Sam Houston Memorial Museum at 936.294.1832 or visit www.SamHoustonFolkFestival.org. Award-winning poets Michelle Boisseau and Wayne Miller will read from their works on Thursday (April 30), at 4:45 p.m. in College of Humanities and Social Sciences Building Room 210. Boisseau is the author of such poetry books as “Trembling Air,” Morse Prize-winning “Understory,” and “No Private Life,” as well as the popular text “Writing Poems,” now in its sixth edition. Her poems have appeared in a number of literary journals, including The Yale Review and The Southern Review, and have received a National Endowment for the Arts poetry fellowship and awards from the Poetry Society of America. Boisseau is a professor of English at the University of Missouri-Kansas City, where she also is associate editor of BkMk Press and the coordinator of the creative writing program. She earned her bachelor’s and master’s degrees from Ohio University and her doctorate from the University of Houston. He is the recipient of the George Bogin Award, a multiple winner of the Lucille Medwick Award, and the Lyric Poetry Award from the Poetry Society of America, as well as a Ruth Lilly Fellowship and the Bess Hokin Prize from the Poetry Foundation. He earned his bachelor’s degree from Oberlin College and his master’s degree from the University of Houston. The event, which is free and open to the public, is sponsored by the SHSU College of Humanities and Social Sciences, the English Department and Poets’ Ink. Books will be available for purchase at the reading. For more information, contact Melissa Morphew, associate professor of English, at 936.294.1944 or eng_smm@shsu.edu. The Golden Key International Honour Society will work to make the planet a better world with a “Books for Africa” drive May 4-14. During those days, the organization will accept used textbooks in blue and orange collection boxes outside of the Lowman Student Center. Unwanted, college-level books published within the past 10 years and any books used in a college class will be accepted, even if those books have highlighting or writing in them. These also include books that the bookstores won’t buy back, according to Golden Key president Jadrian Wooten. “If the books cannot be donated or sold, they are at the very least recycled,” he said. For the project, SHSU’s Golden Key has partnered with Better World Books, which will sell the books online to raise money for Books for Africa or send them directly to Africa. “Book drives like this one have earned over $1,700,000 for Books for Africa since 2003,” Wooten said. Donating these books benefits the campus, earth and students around the world by providing a “green” and “responsible” solution to getting rid of books that are no longer of use to SHSU students. In diverting the books from landfills, students are simultaneously helping improve literacy in Africa, Wooten said. For more information, contact Wooten at jjw001@shsu.edu or Dee Ellwood at dae001@shsu.edu or visit the organizations’ Web sites at www.betterworldbooks.com or www.booksforafrica.org. 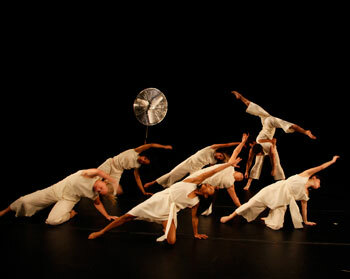 The Sam Houston State University dance faculty members and students, as well as two guest artists, will create “Time Shift” at the University Theatre Center with original works April 30 through May 2. Performances will take place at 8 p.m. each night, with an additional 2 p.m. matinee on Saturday in the UTC Mainstage Theatre. The concert will feature pieces choreographed by dance faculty members, including Jonathan Charles’ “playful take on the hippie movement” called “Dreamin;’” Andy Noble “sleek” “KinkyKool Fan Blowing Hard," which uses industrial fans to propel the dancers through space; as well as works by Dana Nicolay and Dionne Sparkman Noble, according to dance professor Cindy Gratz. In “Following Aunt Joan,” choreographed by Sparkman Noble, five women wearing the classic little black dress dance with chairs and explore themes of sensuality, empathy, and rivalry. “The dance reveals moments of vulnerability and strength, and questions what it means to be a woman of our time,” Gratz said. Critically acclaimed choreographers Sandra Organ Solis and Bill Evans, who will also present original works as invited guest artists. The evening also will feature two student works by Amy Llanes and Jennifer Hart, who represented SHSU at the American College Dance Festival. These include Llanes’ “Porcelain,” which awakens “the child in all of us” as five female dancers illustrate the idea of dolls coming to life while their owners are away and Hart’s “Drift,” a “hypnotizing arrangement of movement, creates a beautiful and tranquil atmosphere,” Gratz said. Tickets are $10 general admission and $8 for students with valid ID. For more information, contact the ticket office at 936.294.3988. The Law Enforcement Management Institute of Texas is raising money for the Primary Immune Deficiency Foundation through a “Blue Jeans for Healthy Genes Day” on Wednesday (April 29). In honor of Primary Immune Deficiency Month, in April, participants are asked to donate $5 to the foundation and wear blue jeans on that day. Participants will also receive a primary immune deficiency disease wristband, sticker and tax-deductible receipt. Approximately 250,000 people are diagnosed with primary immune deficiency diseases in the United States, a disease that occurs in persons born with an immune system that is either absent or hampered in its ability to function. David Vetter, known to the world as “the Boy in the Bubble,” was born without T-cells, B-cells, NK cells, thymus, tonsils or lymph nodes—all which are needed to combat viruses and bacteria infections—and lived his entire life in a sterile germ free plastic bubble. PIDD information pamphlets are available in the LEMIT and Criminal Justice Center lobbies each Tuesday. To sign up for “Blue Jeans for Healthy Genes Day,” e-mail Yvette Shorten at wys001@shsu.edu or call 936.294.3851, or for more information on PIDD or the Primary Immune Deficiency Foundation, visit their Web site www.primaryimmune.org. The School of Music will showcase its students in two concerts presenting bassoon solos and duets as well as some “Opera Magic!” beginning Friday (May 1). The Bassoon Studio recital will be held that day at 5:30 p.m. in Music Building Room 202. In addition to the solos and duets performed by the four student bassoonists, the concert will feature “an irreverent arrangement” of the children's classic “Peter and the Wolf” by Sergey Prokofiev, according to Scott Phillips, assistant professor of bassoon. Later that evening, the SHSU Opera Workshop will present an evening featuring scenes from opera's most magical moments at 7:30 p.m. in the Recital Hall. A second Opera Workshop presentation will be held on Saturday, also at 7:30 p.m. in the Recital Hall. The workshop will include scenes sung in their original languages of Italian, English and German, with supertitles projected above the stage for audience comprehension, according to Dawn Padula, assistant professor of voice and director of opera workshop. Among the other scenes that will be performed include Gaetano Donizetti's “L'Elisir D'Amore” (“The Elixir Of Love”), which centers around a supposed magical elixir that serves as a love potion, and a scene from Gian Carlo Menotti's “The Consul,” which features one of the singers portraying a magician who actually performs tricks. The show presents a variety of operatic genres from classic to modern, and “showcases several of the very talented vocalists from the School of Music,” Padula said. Tickets are $10 for general admission; $8 for non-SHSU students with an ID and senior citizens; $5 for SHSU Students with an ID; and free for School of Music students with a concert attendance card. Tickets are available at the door, which will open at 7 p.m. on both evenings. For more information on either performance, call the School of Music at 936.294.1360. Sam Houston State University’s Phi Delta Kappa chapter will join with the Texas Lone Star and University of Houston chapters to honor Texas teachers during ChalkWalk on Saturday (May 2). The event will begin at 9 a.m. on at Lone Star College in Tomball. Through ChalkWalk, PDK members, as well as nonmembers, identify a teacher they would like to honor and walk for 3K in that teacher’s name. Participants raise money for education by collecting donations. All honored teachers will be included on the ChalkWalk “Wall of Honor” and will receive personal letters of appreciation from walkers and donors, notifying them that they have been added to the Wall of Honor. In addition, the president of PDK International, John Armato, will speak during the event, which is expected to end by noon. The SHSU Phi Delta Kappa chapter is comprised of faculty members and graduate students whose mission is that of education, scholarship and service. All proceeds from the Chalkwalk donations will be used to fund scholarships for SHSU students who want to be teachers. For more information, contact Foster at 936.294.1142 or asf004@shsu.edu. French students, or those interested in the language, can get a taste of translations from a number of authors from the country during a translation workshop on Tuesday (April 27). That day, assistant professor of French Madelina Akli will work with both English- and French-speaking students at all levels from 3:30-4:30 p.m. in the history department’s conference room, located in Academic Building IV Room 452. “Whether you are you learning French at an intermediate level or an advanced level, don’t hesitate to be adventurous,” she said. For more information, contact Akli at 936.294.1400 or mxa016@shsu.edu. The conference, sponsored by Austin Community College’s Department of American Sign Language in conjunction with their Interpreter Preparation Program, “was an excellent way for students to dive into what deaf culture is really like, and experience it firsthand,” said Robert Blair, foreign languages pool faculty member who teaches ASL at SHSU. “The event was intended to promote the beauty of ASL, as well as to celebrate it as one of the most amazing languages in the United States,” said Blair, who had his students write accounts of their experiences. During the conference, students were able to see presentations by various presenters, including one by “a remarkable woman who is deaf-blind who presented on how she goes through her everyday life and the goals and successes she has had within promoting a better quality of living for deaf-blind people through her outreach efforts,” Blair said. They were also able to learn about ASL/IPP programs at other colleges and universities, as well as interpreter services; companies specializing in technology for deaf persons; special programs, such as deaf yoga for the deaf community; and a recruiting booth for the Texas School of the Deaf searching for prospective employees interested in teaching and/or working with deaf youth. SHSU educational leadership and counseling professors recently participated in 40 peer-reviewed presentations and invited events during the American Educational Research Association’s annual meeting. Beverly Irby, EDLC professor and chair, was asked to serve as a “distinguished discussant” for a group of selected distinguished papers from four state and regional educational research associations, and work by EDLC professor Anthony Onwuegbuzie was selected as a “distinguished paper” during the session. Four doctoral students mentored by Irby also presented during the meeting, including counseling students Yu Fen Lin and Sallie Helms and educational leadership students Ling Ling Yang and Janice Taylor, along with health and kinesiology department chair Alice Fisher. In addition, Irby was elected from a national slate to the executive board of the AERA learning and teaching in educational leadership special interest group, and EDLC associate professor Rebecca Robles-Pina was elected as chair of the AERA Stress and Coping Special Interest Group. Genevieve Brown, dean of the College of Education, previously served as the 2009 past chair and AERA program chair of the research on women and education special interest group. The Educational Researcher, Advancing Women in Leadership Journal, Graduate Research Journal, three of the seven journals supported by the EDLC department, also were featured in the AERA journal talks. An article written by Irby, Brown and two other co-authors, “The Synergistic Leadership Theory,” published in 2002 in the Journal of Educational Administration, was recognized as one of the journal’s most requested papers. The JEA is a Tier 1 publication in educational administration, Irby said. The AERA annual meeting was held April 1 in San Diego, Calif.